The death of Apple co-founder and CEO Steve Jobs earlier this month elicited a wave of grief and sorrow that was on display across the digital spectrum. And, while I too was certainly sad to see a vibrant man in his mid-50s lose a battle to cancer, leaving three young children without a Father and a wife without her partner and soulmate, the outpouring of grief and posthumous gratitude made me curious. Why were so many people affected by the passing of a man they never knew, never met, and likely only occasionally saw in magazines, TV, and the web? Certainly, whether he liked it or not, Jobs was a public figure, though he went to great lengths to maintain his privacy and shroud his personal life in secrecy. While his desire for privacy created an aura of mystery, it was his public appearances that gave birth to the Jobs legend. His keynote appearances (which became known as “Stevenotes”) to introduce the company’s newest offering became hotly anticipated events to the devoted Apple fanbase and, over time, a predictable pattern emerged. Jobs would appear last (always sporting the same signature look), hype Apple’s product lines and sales figures, and then issue some general concluding remarks before feigning his stage exit, which he would always stop with the phrase, “But there’s one more thing.” And from there, Jobs would introduce the next piece of Apple magic that was both beautifully designed and simple to operate. It was also during these appearances where the toll of Jobs’ cancer slowly showed its’ effects. While he was known as a hands-on executive who wanted his marketing to be every bit as well designed as his products, it was his role as the face of Apple that was Jobs’ master stroke. To the devoted Apple user (and plenty of stockholders), Steve Jobs and Apple were one and the same and, as the “face” of the company, people grew to know him from his Stevenote appearances, or at least feel they knew him. Hence, Steve Jobs performed a virtually impossible marketing trick: he made a personal connection with his customers. I’ve written about the importance of a personal connection before, but Jobs’ role with Apple created the perfect combination of product and personality. The product part came from the loyal devotion of Apple users. Perhaps its the cool factor the design of Apple’s products offer or the snob appeal that comes from owning a more expensive gadget that everybody wants. Or maybe it’s their integration into several areas of a user’s daily existence or simply their ease of use and ability to simplify one’s life. Whatever the reason, Apple consumers seem to develop a stronger attachment to their Mac desktop or laptop computer, iPhones, iPods, and iPads. As the face of Apple, Steve Jobs became the person Apple customers connected with. 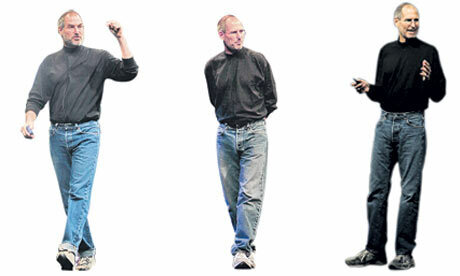 Regardless of whether he came up with the idea for their desktops, laptops, iPods, iPads, iPhones, or the App store, or even had a hand in every level of their design and development, that he was the one who introduced them and showed off all their features with the same quirky routine helped customers make a personal connection to Steve Jobs and, by extension strengthened their bond to the Apple brand. So why is that personal connection between brand and consumer important? Because, when your customers connect with you or your business on a personal level, they take ownership of what you sell and, by doing that, become ambassadors for you and your brand. They tell their friends where they got it, how it works, and how it’s made their life better. They tweet about it on Twitter or mention it on Facebook if a friend or acquaintance asks for a recommendation. They post their positive experiences on user review sites on the web. In other words, when you make a personal connection, you build customer loyalty and empower an army of people marketing your goods and services for free!